Two of my colleagues had a gourd growing competition. This is one of the competitors’ offerings. This entry was posted in Food. Bookmark the permalink. It seems a shame to cut into those! They’re so pretty and so diversified – what a great job they did with these. You can sure tell it’s harvest time. you’re right. they’re stunning, vibrant but calm, positive. somehow, they make me feel good, just by looking at them. Good Gourd! I actually titled a blog post with that once, oh dear….They are very pretty though aren’t they? 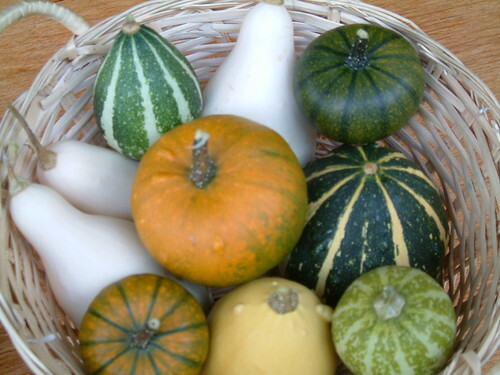 Holler – They’re ornamental gourds so aren’t cut into or eaten. Just there to look pretty! Pia – Blog about it!! Maninas – Me too. I couldn’t stop staring at them!